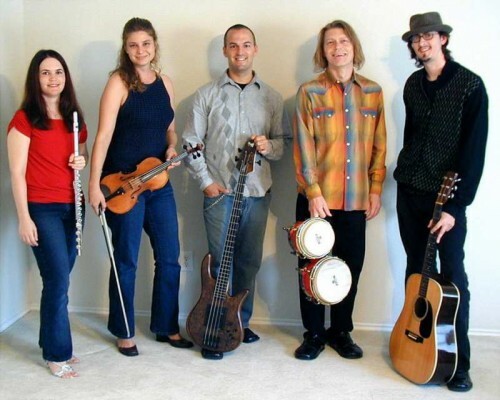 Tin Roof Tango will perform at Coastal Bend College on March 6 at 3 p.m. in the Gertrude R. Jones Auditorium. The performance is part of the Beeville Concert Association calendar. This concert is made possible with partial funding from the Coastal Bend Community Foundation’s Janet Harte Memorial Endowment Fund. performance at the Dallas Menswear Mart, the band (then under the name Instant Irish) was performing exclusively Celtic music. Bandleader Mark Shelton soon added traditional American tunes to their repertoire of Irish music. In 1988, the quintet (under the name Folk Like Us) became a part of the Young Audiences of Greater Dallas roster and began to perform Arts-in-Education programs in schools. Today, Tin Roof Tango remains one of the top booked acts on the Dallas roster and is also affiliated with Young Audiences of Houston and the Southeast Texas (Beaumont) chapter as well. The band produced its first recording in 1990. In 1992 the Rhode Island based record label released the highly successful An American Christmas selling in excess of 60,000 copies and receiving critical acclaim. As the repertoire changed, so has the group’s moniker, and in 1994 the band took on its current name, Tin Roof Tango. April 2000 marked the release of Tin Roof Tango, the group’s current CD, featuring a high energy array of world music repertoire. Mark Shelton leapt at the chance to play snare drum in the elementary band program in McNairy County, Tenn. It didn’t quite hit him, at the time, how many drums he might have to carry around in the future. Mark served as Visiting Artist at Wayne Community College in North Carolina before moving to Texas. In addition to playing percussion regularly as a staff musician at Gateway Church, Shelton’s performance credits include work with The North Carolina Symphony, The Shreveport Symphony, and The Dallas Wind Symphony. Jonathan Malone began to learn the guitar while recuperating from an injury. Since that pivotal decision, he has gone on to study recording technology and music at Cedar Valley College in Dallas. In addition to duties with Tin Roof Tango, Malone sings and plays electric guitar in the band, Rolo’s Pocket. While attending the University of Oklahoma, Rachel Jarvis studied English and played cello in the OU Symphony Orchestra. Jarvis toured Oklahoma performing for children with Street Players Theatre. After moving to Texas, she created the Mid-Cities Strings music school where she teaches and conducts. Rachel was the principal cellist of the Fort Worth Civic Orchestra from 2000-2004. A versatile musician, Rachel also performs on violin and viola. Born in South Korea, Young Heo moved to the United States during his teen years. Armed with a degree in Jazz Studies from University of Texas-Arlington, Heo teaches guitar, bass and piano in the Dallas area and freelances in variety of settings. Heo performs and records with King’s Region Worship Band. Cecilia Hamilton teaches flute at Austin College. With degrees from the University of Alabama and the University of North Texas, Hamilton conducts a community. Hamilton has a strong interest in Baroque flute and early music. An enthusiastic supporter of new music, she has premiered several compositions and appeared at a number of Contemporary music events. The concert is free to school-aged children and CBC students with current identification and season ticket holders. Otherwise, admittance is $10 at the door.